The memorial stands in St Mary's churchyard and has been refurbished by Group Capatin Roland Osterberg to make the engraving legible. It takes the form of a Celtic Cross mounted on a short pillar resting on a plinth all mounted on a one-stepped base. There are 11 names for World War 1. The memorial was unveiled in 1920 by Colonel W Selby-Lowndes. 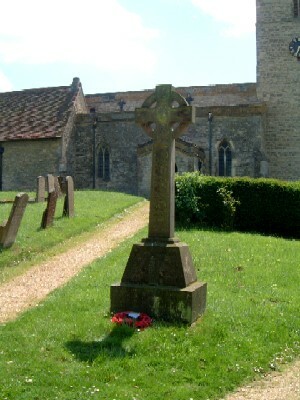 There is no Second World War memorial but the graves around the church and plaques inside the church indicate the involvement. 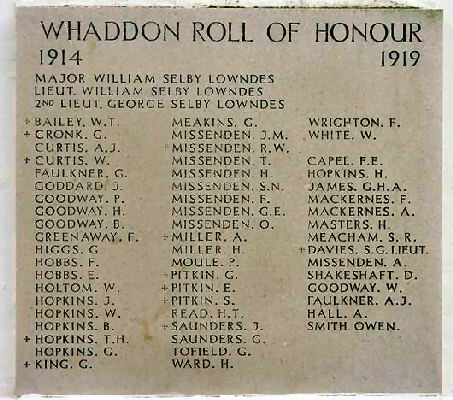 There is a further secular World War 1 Roll of Honour with the names of those who served, and died, built into the Jubille Hall (village hall). The names here have been sorted into alphabetical order for ease of reading and comparison. There are a few discrepancies between the memorial and the Roll of Honour all noted below. 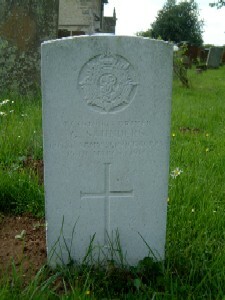 Private 27880, 8th Service Battalion, Gloucetsreshire Regiment. Killed in action Friday 11th August 1916 in France & Flanders. Age 19. Born Willsden, London, enlisted Bletchley, resident Whaddon. Son of Elizabeth Bailey, of Whaddon. Buried in ST. QUENTIN CABARET MILITARY CEMETERY, Heuvelland, West-Vlaanderen, Belgium. Grave I. A. 26. Private 100800, Draft, Machine Gun Corps (Cavalry). Drowned at sea, off Alexandria (from H.T. Osmanieh) on 31st Dec 1917. Born Stoke Hammond, Bucks. Son of Harry & Edith Curtis. Enlisted 24th May 1916, Bletchley, into the Royal Bucks Hussars, service no. 3133. 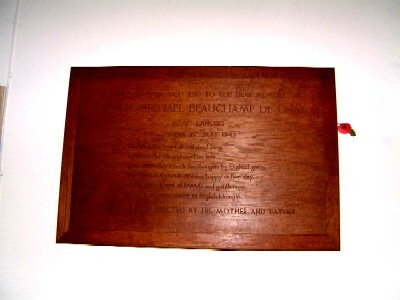 No known grave, Commemorated on the Chatby Memorial, Egypt. Note: Information compiled from a combination of family history research & a letter from the CWGC. One reference on the internet states that H.T. Osmanieh was struck by a mine but family oral tradition says that it was sunk by torpedo, as soon as an anti-submarine net was lowered prior to it leaving the harbour. At the time of William's enlistment, the family were living in Whaddon. Later in 1916, his parents and siblings moved to Bainton, a hamlet in the parish of Stoke Lyne, Oxon. [Spelt Sydney on SDGW] Second Lieutenant, 9th Battalion, Royal Welsh Regiment. Killed in action Tuesday 31st July 1917. Age 31. Son of George and Mary Davies; husband of Daisy Evelyn Davies, of "Ellesmere," Pine Grove, Rhos-on-Sea. English Congregational Minister, Stony Stratford and Whaddon, Bucks. Commemorated on YPRES (MENIN GATE) MEMORIAL, Ieper, West-Vlaanderen, Belgium. Panel 22. Private 20425, 6th Battalion, Bedfordshire Regiment. Died of wounds Saturday 28th April 1917 in France & Flanders. Age 20. 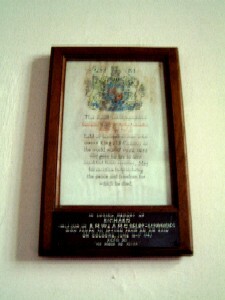 Born Whaddon, enlisted Bedford, resident Filgrave. Son of Mr. and Mrs. Charles Miller, of 18, Filgrave, Newport Pagnell. Buried in BOULOGNE EASTERN CEMETERY, Pas de Calais, France. Grave IV. C. 38. Private 2434, 1st/1st Buckinghamshire Battalion, Oxfordshire and Buckinghamshire Light Infantry. Died Friday 12th January 1917 in France & Flanders. Age 29. Enlisted Aylesbury, resident Whaddon. Son of Edwin and Annie Pitkin, of 28, Queen St., Wolverton Rd., Stony Stratford. Native of Whaddon. Brother of Stanley (below). Buried in ST. SEVER CEMETERY EXTENSION, ROUEN, Seine-Maritime, France. Grave O. IV. K. 2. Private 8/462, Otago Regiment, New Zealand Expeditionary Force. Died Thursday 6th May 1915. Age 20. Born Whaddon. Son of Edwin and Annie Pitkin, of 26, Queen St., Stony Stratford, Bucks. Brother of Ernest (Above). Buried in ALEXANDRIA (CHATBY) MILITARY AND WAR MEMORIAL CEMETERY, Egypt. Grave A. 98. Volume 1, Part 1, Page 291. PITKIN, Stanley. Private, number 8/462, 8th Southland Coy, Otago Infantry Battalion, New Zealand Expeditionary Force. 5th son of Edwin Pitkin, of Whaddon, co. Bucks, Agricultural Stockman, by his wife Annie dau of Albert Reynolds. Born Whaddon, co.Bucks 8-9-1894, educated National school there, went to New Zealand in 1911, and settled at Dipton, Southland N.Z as an Agricultural worker. Joined the New Zealand Territorials in 1912, volunteered for Imperial service on the outbreak of the European war in Aug 1914, left for Egypt, took part in the landings at the Dardenelles 25-4-1915 and died on H.M hospital ship Dongola 7-5-1915 of wounds received in action in a bayonet charge there on the 2nd. Driver T/391992, 662nd H.T. Company, Royal Army Service Corps. Died at home Friday 15th March 1918. Born and resident Whaddon, enlisted Bletchley. Formerly 8408, 5th Battalion, Bedfordshire Regiment. Buried near east boundary in ST. MARY CHURCHYARD, WHADDON, Buckinghamshire. Captain 170269, "A" Squadron, 16th/5th Lancers, Royal Armoured Corps. Died in Tunisia Sunday 16th May 1943. Age 22. Son of Colonel G. H. B. de Chair, O.B.E., M.C., and Mrs. de Chair; husband of Anne de Chair, of Fernhurst, Sussex. Buried in EL ALIA CEMETERY, Algeria. Grave 12. G. 35. Captain 139432, Royal Corps of Signals. Died on active service Sunday 22nd June 1941. Age 28. Son of George H. Maitland Kirby and Elsie Mari Maitland-Kirby, of South Kensington, London. 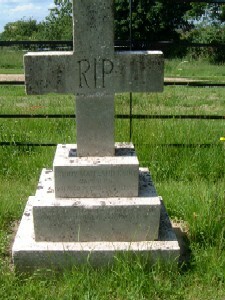 Buried in ST. MARY CHURCHYARD, WHADDON, Buckinghamshire. Signalman 2595713, Royal Corps of Signals. 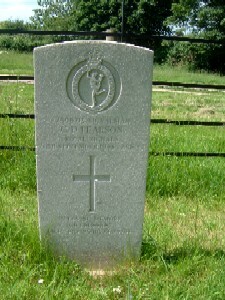 Died in Whaddon, when he fell off a tall radio mast during maintenance. [Whaddon Hall was an outstation for the nearby Bletchley Park code-breakers] Sunday 26th September 1943. Age 42. Son of William and Florence Ellen Pearson, of Port Erin, Isle of Man. Buried in ST. MARY CHURCHYARD, WHADDON, Buckinghamshire. Sergeant 1585667, 49 Squadron, Royal Air Force Volunteer Reserve. Failed to return from an air raid on Cologne 16-17 June 1943. Listed as dying Thursday 17th June 1943. Age 20. Only son of RRichard M. W. Selby-Lowndes, and of A. M. Gladys Selby-Lowndes, of Charlton Kings, Gloucestershire. Buried in EINDHOVEN (WOENSEL) GENERAL CEMETERY, Noord-Brabant, Netherlands. Plot JJB. Grave 104. Trooper DL5988. 4th Dragoon Guards. Born 8 September 1887 in Whaddon, died 18 December 1955 in Wantange, Oxfordshire. Inalided out of the Army 4 January 1916. Brother of Alfred (above).